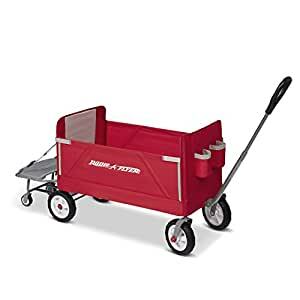 Radio flyerâs 3-in-1 tailgater wagon is designed as a full-sized, EZ fold wagon for kids that offers additional cargo storage. The stow away cooler caddy provides extra space for the family cooler, folding chairs and other tailgating needs. With an easy one hand fold, you can take or store the wagon anywhere! the high seat backs and thick padded seats with seaters provide a comfortable ride. The safety straps and zippers transform the wagon into bench seating. The DuraCleanTM fabric can be easily wiped clean and features 2 front cup holders and a storage pouch in the back, plus a magnet to hold the handle upright when not in use. Maximum weight capacity 150 lbs. In wagon and 50 lbs. On cooler caddy. For 1 Â½+ years. Radio Flyer must have *just* released an updated model of the 3-in-1 because I absolutely could not find the “with canopy” one anywhere, even the Radio Flyer website. It is fabulous and seems to have solved all the previous issues listed in reviews. I was torn between this RF folder and the “fancy” one with the canopy and plastic seats and all that. THEN the other day there was magically another option available! The “with canopy” option. I jumped on it and am so incredibly happy I did. It is FANTASTIC! * It has belts!! 2 of them! That can be huge or really tiny, and are very smooth to adjust. I think that was all of the issues mentioned in previous reviews? Oh, there is also a handy magnet in between the front cupholders that snags the handle to hold it up! So, this wagon has belts which is wonderful for my 1 year old. It states no more than 2 children, I would assume that’s because of the seatbelts, there are only 2. The weight limit is 150lbs, which is huge! I mean… that’s me. So I definitely won’t hesitate to let my older two sit unbuckled in this. In fact, they all fit with plenty of room compared to our past, seated wagons! I love how this is an easy, comfy bed without any need to really pad it like the plastic ones with fold out seats. And allows ample room for playing and eating, and for me to sit too. The side coming down is wonderful to act as a door too, my kids’ favorite thing about our one plastic wagon was the door. The canopy is crazy easy to put up and take down! Press the side buttons, slide the rod up and snap the canopy on. Done. This thing is so easy to fold, it took me maybe… 30 seconds? To take down the canopy, twist it together, store it, push all 4 rods down, retract the handle and pull up on the center handle. Done. Crazy! And it was so light, pulls easily behind me while it’s folded. Stands by itself while folded. It doesn’t stay together with any sort of latch or anything *but* I just undid the velcro that acts as an extra security feature for the zippered front panel, and crossed them to the opposite side… and it stays closed. Bam. Done. Again. It is also super light! Lighter than my Chicco Liteway Stroller! And way less awkward to get into the trunk! I am completely in love with this, I couldn’t wait to tell everyone about it! It’s going to be nice over the next few days so we’ll be taking this down to the park and to the zoo, I’ll update after! Purchase this as my children are too big for a stroller these days. I needed something for amusement parks malls and places I know a lot of walking will be done. I didnât want something that was cheaply made or something that would break easily. Got to test it out at a fair a day after the wagon was delivered. Not only was it great in crowded places and easy to pull, using it as a bench was amazing. It was able to fit 3 kids sitting and the roof was used as a table for food. Since buying the wagon it has been to a fair the mall and an amusement park a few times and it has been great each time. I also love the fact that I can fold the wagon and it is still able to move which makes it great when you need to store the wagon in public. There are conflicting reports about seatbelt, but the newest model with the canopy does come with seat belts. The other problems reviewers mentioned with tipping and not steering well seem also to be better, or at least I haven’t experienced them. This wagon is great, I do wish the handle was a little longer, even at max extend I’m bending down somewhat to pull it (I’m 5’10”). The assembly instructions could have been better, I had to get out a hammer to tap in the two wheels because they kept falling out when I was trying to just snap them in with my hand. I’m so happy with how light and easy it is to fold and unfold, and so far my 1.5 year old likes riding in it. It’s so convenient for transporting him as well as a lot of stuff. EDIT: I’ve taken off two stars, I’ve become pretty disappointed in this wagon in the two weeks I’ve had it. I still love a lot of things about it, but one of the tired falls off EVERY time I lift it up. I’ve tried every way possible to get it to click in, it simply won’t stay. They stay on when it’s rolling so it’s not a safety issue, but it’s highly inconvenient to have to pick it up the wheel off the ground every time I try to transport the wagon. One of the reasons I picked this wagon was for ease of transport, which is severely impacted by this problem. 1. The wire that helps the canopy keep its shape snapped when we tried to put it away, leaving the canopy buckled and two sharp, pointy pieces of metal sticking out, waiting to poke little eyes. 2. The buckles on both seat belts are stuck, rendering them unusable. Both seat belts are stuck in the closed position, and my son is too little to be trusted not to stand up while we’re rolling. We had hoped to be using this wagon over the holiday weekend, but unfortunately the buckle issue in particular means we won’t be using it as anything but a bench until the replacement arrives. I am keeping my fingers crossed that this is a defect unique to this specific wagon and not all wagons of this model, but given how immediately these problems presented, I’m concerned about the quality of materials used in this product.